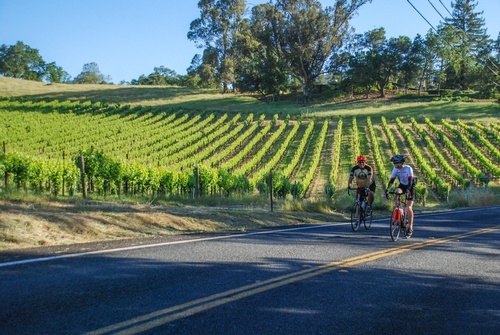 Join us as we pedal through the heart of Sonoma County Wine Country. Road and mountain bikes, skinny tires and fat tires welcome. Moderately challenging ride through the Alexander, Dry Creek & Russian River Valleys. Distance options include 20, 35 or 60 miles; gradually increasing in difficulty. The 20 mile route is rather flat, while the 35 & 60 mile routes have more rolling hills and moderate climbs. Come up for the day or spend the whole weekend with us; there is much to see and do. Healdsburg offers many lodging options and is central to more than 100 wineries. Bicycling Magazine listed Sonoma County as one of “The 7 Greatest Rides on Earth” --- alongside the likes of Tuscany, Crested Butte, and Moab. Completely mapped out courses with arrows and signs to lead you in your desired direction. $90. Click here to register.